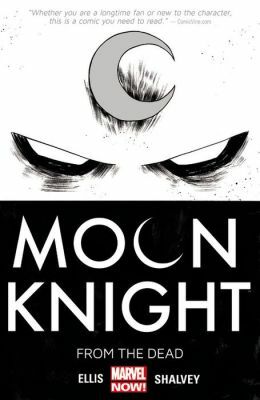 The superstar Moon Knight creative team of Warren Ellis and Declan Shalvey reunite for an ambitious, genre-bending Image Comics series. Years ago, five agents of the British government – each a genius in their specific field – created something called the ‘Injection.’ In doing so, they poisoned the world – reality itself – and are now dealing with the horrific consequences of their experiment. Bizarre, toxic aberrations are forming on our planet; these people are our only hope. Blending elements of folklore, technology, history and science fiction,Injection is part sci-fi epic, part procedural. In typical fashion, Ellis presents plenty of theory and cool concepts – fantastically depicted by the super-talented Shalvey – but doesn’t offer a full explanation for transpiring events; that will surely come, later. For now, this first volume hooks the reader with stunning art, dangling plot threads – a hint of grander danger to come – and the five protagonist’s unlikely allegiance. As brilliant as they are – super-smart, extraordinarily talented – they aren’t infallible. Each of them possess demons, not all of which are explicated in this volume, but suggests saving the world won’t be run-of-the-mill. Indeed, their damaged psyches might prove their greatest obstacle. Shalvey’s art deserves superlatives; all of them, in fact. He is unrivalled, stylistically; and partnered with colourist Jordie Bellaire, his illustrations have never been so striking. He is a perfect artist for Ellis; equally capable of keeping readers’ eyes glued to the page during character conversations, as he is blowing minds when he’s able to cut loose and portray the deadly aftereffects of the Injection. Its first volume suggests The Injection will earn a place in Ellis’ Greatest Hits. There’s a long way to go, of course – lots of loose ends to tie together, characters to develop further. But what a launch! MOON KNIGHT: FROM THE DEAD is one helluva good collection. Its architects – veteran scribe Warren Ellis, illustrator Declan Shalvey and colourist Joride Bellaire – radiate assuredness in their craft. The script is tight and nuanced – you won’t find overbearing narrative captions here – and the artwork is stunning, the sheer white of Moon Knight’s costume – or suit, as he’s more frequently clad in here – almost an eyesore. Few creators could pull of a scene involving Moon Knight dejectedly facing the glower of the skeletal Egyptian moon-god Khonshu, alongside the two ghosts of his disassociated identities, and have it pulsate with the underlying dread conjured by Ellis, Shalvey and Bellaire. This is a team working at the peak of their powers. Together, they have rebooted Moon Knight for a new audience, and rejuvenated the character for fans of yore. Moon Knight’s backstory is overwhelmingly convoluted, even for a reader who has invested more than twenty years in the Marvel Universe. Rather than focus on the history, and try to explain the unexplainable, Ellis chooses to press forward with his six loosely connected tales, and lean on Moon Knight’s past only when it benefits the thrust of his own narrative. In MOON KNIGHT: FROM THE DEAD, the vigilante plays the role of the Marvel Universe’s Batman. Equipped with Batarang-like throwing-discs and a sleek automobile, as well as a variety of gadgets (albeit with a supernatural edge) Moon Knight takes on a variety of evil forces, including a deranged S.H.I.E.L.D. agent, a rogue sniper, intangible ghosts, and a psychotic police officer desperate to take Moon Knight’s place. Ellis wisely strips his script of surplus, allowing Shalvey and Bellaire the space required to concoct stunning renditions of Moon Knight in action, and expertly story-boarded set-pieces. Our first shot of Moon Knight strutting towards a crime scene is worthy of framing, and a later sequence involving his slow climb up the stairs of a villain-infested apartment is possibly one of the finest combat scenes ever penciled. MOON KNIGHT: FROM THE DEAD is the kind of reboot that made the MARVEL NOW! initiative so successful. By allowing super-talented creators the opportunity to tell the type of story intrinsic to their tastes they have borne something truly marvelous. Moon Knight fan or not, comic fans owe themselves the pleasure of this collection.